Our US system of measurements makes no sense, even to Americans. We cannot even call it English measurements because our system is different than the pre-metric English system. For example, how many US tablespoons (tbsp.) are there in a US cup? The answer is 16, but no one knows that; I had to look it up. A harder question is how many cups are in a bushel. The answer here is 148.96848 cups per bushel. How many feet are there in a furlong or a fathom? When the cookbook calls for 6 ounces, is it talking about volume or weight? How many gallons are there in a cubic foot? There are 7.48. What do you do if your 7/8th inch wrench is just slightly too small? Now you have to mess with fractions and come up with an answer such as 15/16th inch. This same situation is made far easier in the metric system. If the 22 millimeter wrench is too small you simply move up to the 23 millimeter wrench. By contrast the metric system is simple, elegant and highly intuitive. Everything is in multiples of tens, hundreds, and thousands. A meter is a little over a yard long (39.37 inches). A kilometer is 1,000 meters (0.620 miles). It is 10,000 kilometers from the equator to the North Pole. A centimeter is 1/100 of a meter, or .3927 inches. A millimeter is 1/1000 of a meter or 0.0393 inches. A cubic centimeter (cc) is a measure of volume. This is where things get interesting. One cc is equal to another metric measure, the milliliter. A milliliter is 1/1000 of a liter. Liters and milliliters are used to measure the volumes of liquids. This is also called displacement. In the cubic centimeter = milliliter equality we have the link between distance and volume. And now it gets even more interesting. One cc (or 1 ml) of water weighs 1 gram. Now we have a direct connect between distance, volume, and weight. A thousand milliliters of water equals 1 liter, which is very nearly a US quart (1.06 quarts). One liter of water weighs 1000 grams or one kilogram. A kilogram (or kilo) is equivalent to 2.205 US pounds. You could give your weight as 90.7 kilograms instead of 200 pounds. A metric ton is 1,000 Kilograms or 2,205 pounds. The US is the only country in the world that uses our goofy and idiosyncratic system of measurements. 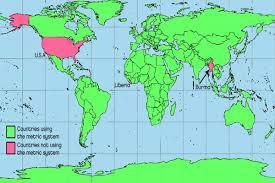 The entire planet has gone metric except for the United States, Liberia, and Myanmar (Burma). We lost one Mars probe because the scientists at NASA confused meters with feet in their calculations. We live in a global trade environment with one system of measurement. Using a different system of measurements makes us less able to compete in foreign markets. If a company is making anything for export, the company simply must use the metric system. There are no 7/8th inch wrenches abroad. Most of our measurements could be converted to the metric system within a few years. We could buy gasoline and ice cream by the liter, bananas and potatoes by the kilogram, rope and fabric by the meter. We could adopt metric clothing sizes with little trouble. We could change our road signs and speed limits to KPH (kilometers per hour) with little fuss. We could report temperatures in Celsius, where water freezes at zero degrees and boils at 100 degrees, instead of Fahrenheit, where water freezes at 32 degrees and boils at 212 degrees. Body temperature in Celsius is 37.0 degrees. None of this would be overly difficult. The hardest part of the conversion will be in the building trades, where everything is in US measurements. We have 4 foot by 8 foot sheets of plywood, 3/4th inch pipes. But 2 x 4’s are not really 2 inches by 4 inches. Some conversions will require adapters, such as a water heater built to metric standards will need pipe adapters to fit legacy pipe dimensions. Some items such as floor tiles will create difficulties. Currently tiles come in sizes such as 18 inches square. These 18 inch tiles will be needed for some time to come as people do remodeling projects. But when new floors are laid the contractors may use comparable metric tiles that are 500 centimeters or 1/2 meter square. Again, the building trades will have the most difficult metric conversions. But other countries have done this and we can do this here as well. Metric conversions will take some time and effort on our parts, but in the end we will be much better served. We need to adopt the world standard of measurement or be left behind.